NaharGarh Fort is at approx 700feet high from city level on the edge of Aravalli hill offering a breath taking view of the Pink City Jaipur. 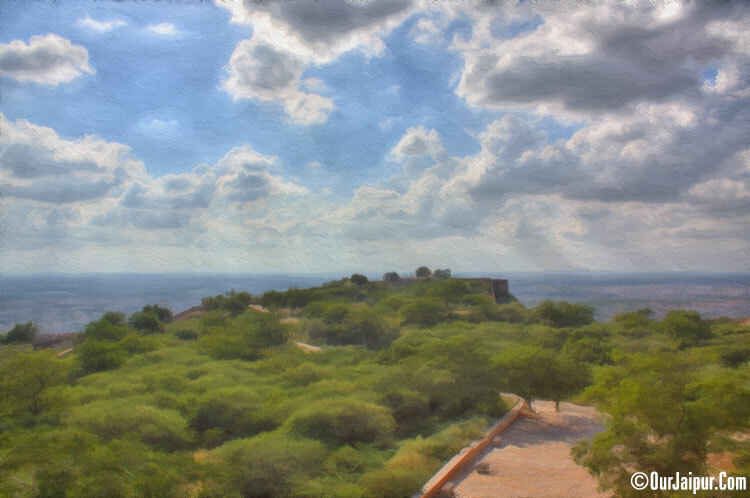 Nahargarh Fort of Rajasthan is the first of the three forts built by Maharaja Jai Sawai Singh of Jaipur in Rajasthan. 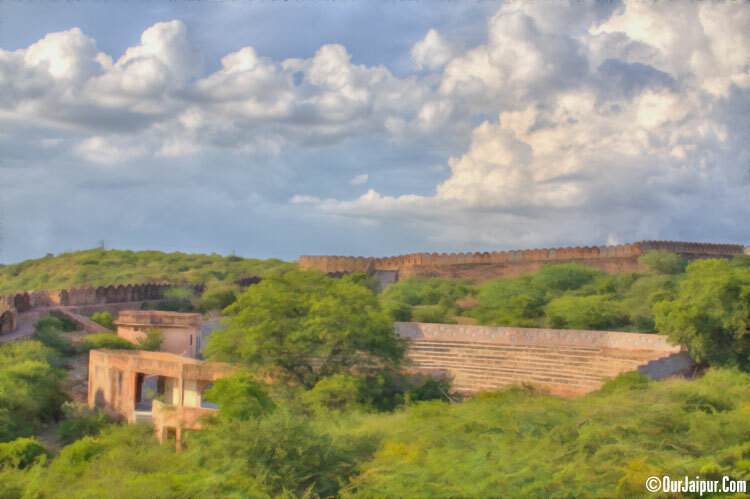 Along with Amber Fort and Jaigarh Fort, Nahargarh once formed a strong defence ring for the city. 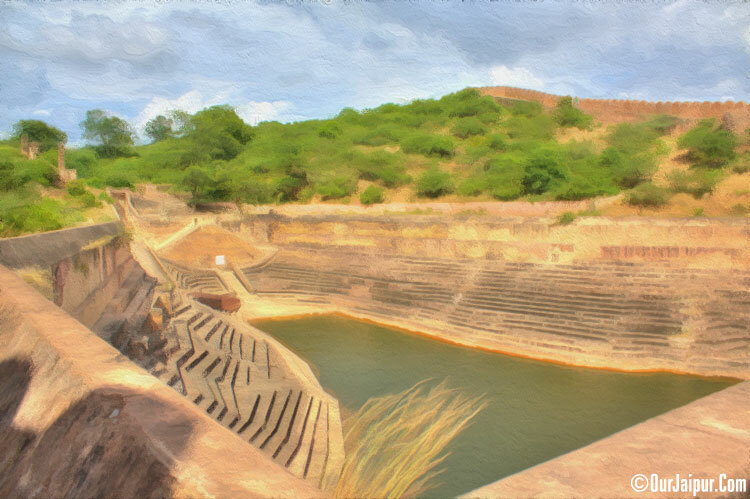 The fort was originally named Sudarshangarh, but it became known as NaharGarh, which means 'Abode of Tigers'. The beauty of the place is so refreshing that it remains fresh in the memory for a long time. 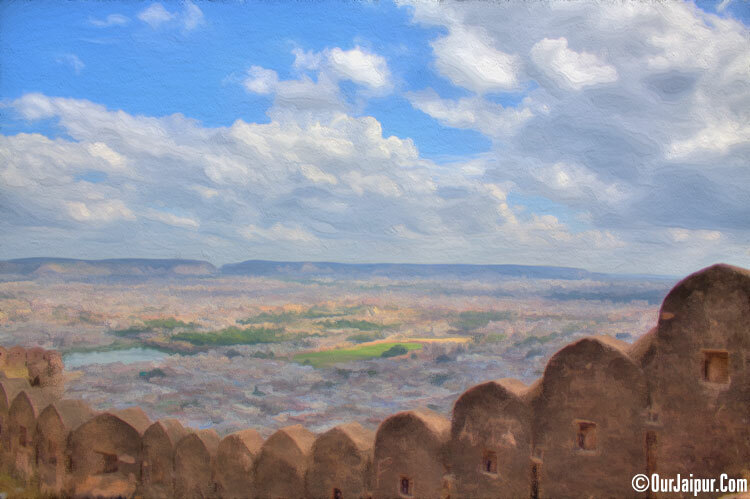 In this post instead of putting simple photographs I gave them the Painting effect Cause whenever I go at NaharGarh Fort I feel like I am living in a Painting created in History by the colors of Romance. 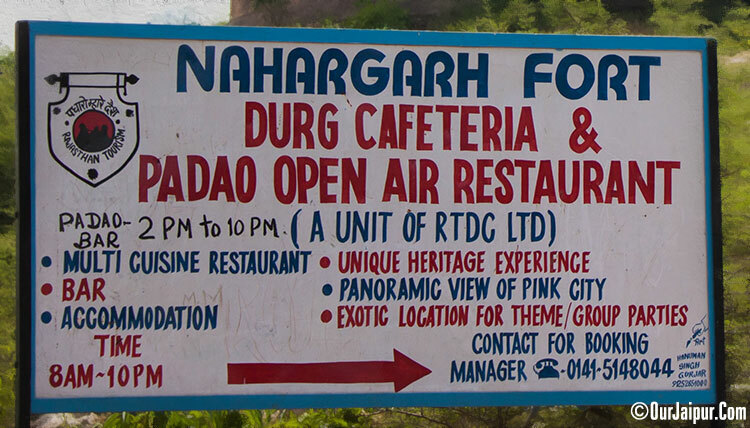 How to Reach Nahargarh Fort. 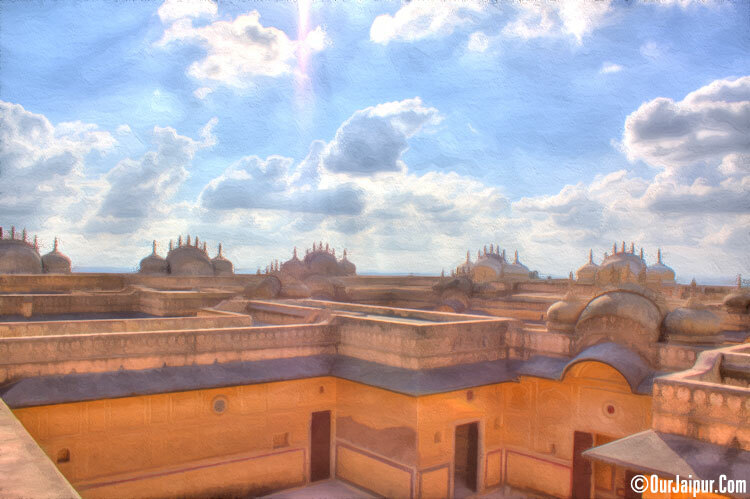 The Nahargarh Fort in Jaipur Rajasthan is approx 23 kilometers away from the city Railway station and Bus stand. Its on the Aravalli hill and There is No Public Transport available to go there, Taxi or Rental Car is the best and the Safest Options. Big No No to Autos and it depends if you are free spirit kind of person, living life on edge, getting drunk, living a rebellious kind of life and you are in your teens or twenties then you can try Bikes also, for others it would be too tiring. 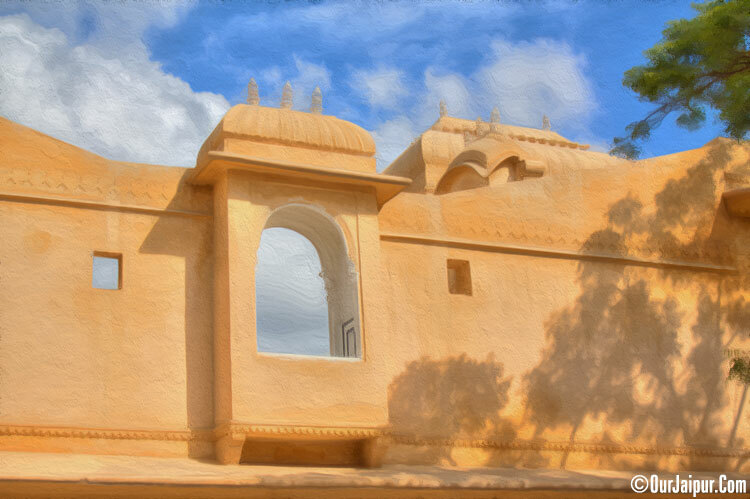 History and Architecture Of NaharGarh Fort. 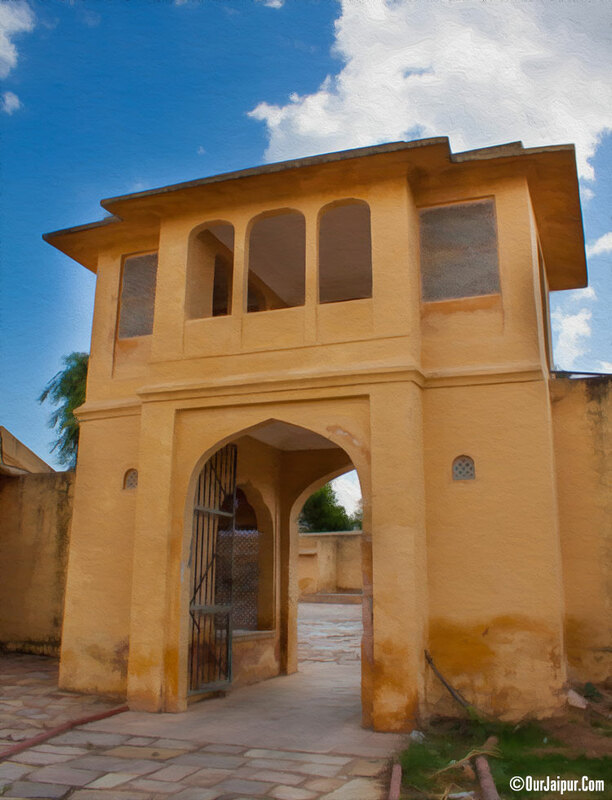 The fort was built in 1734 by Maharaja of Jaipur Sawai Jai Singh II. Nahargarh fort was mainly built to strengthen the defense of the city, owing to the height of the Aravali hills it gave a wide angle view of the surrounding and thus helps in keeping a watch of approaching enemy. It was extended in 1868. 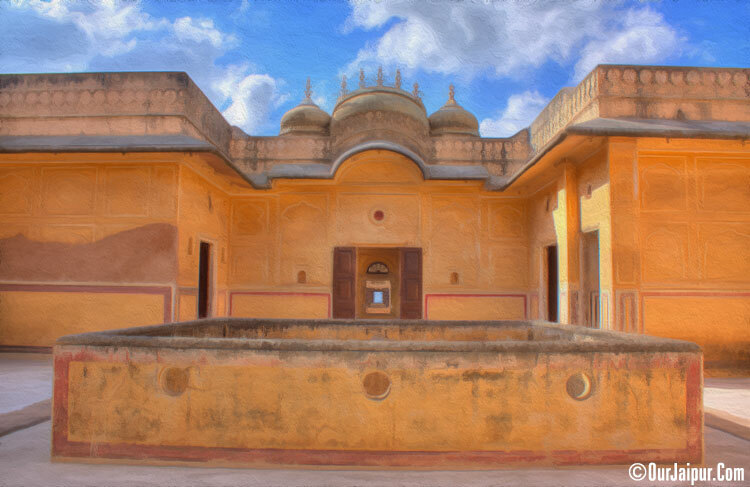 In the 1880s Maharaja Sawai Madho Singh transformed Nahargarh into a monsoon retreat. He ordered the Raj Imarat, responsible for royal construction projects, to design a pleasure palace within the fort known as the Madhavendra Bhawan. Vidyadhar Bhattacharya, the designer of Jaipur of Rajasthan, built this palace with its beautiful interiors of frescoes and stucco designs. 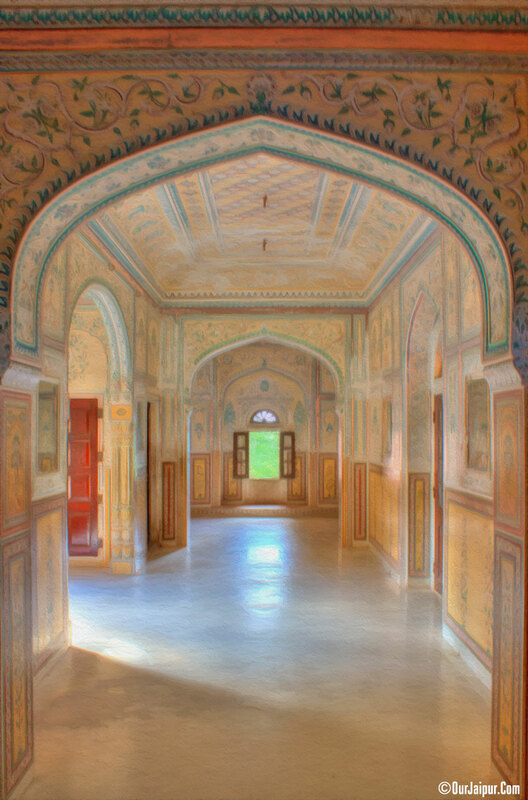 you can also say its architecture is unique combination of Rajput style and Mughal style of architecture. Certain European style additions like rectangular windows and western styled toilets are also there. Madhavendra Bhavan boasts of 12 completely alike suites for the use of queens. 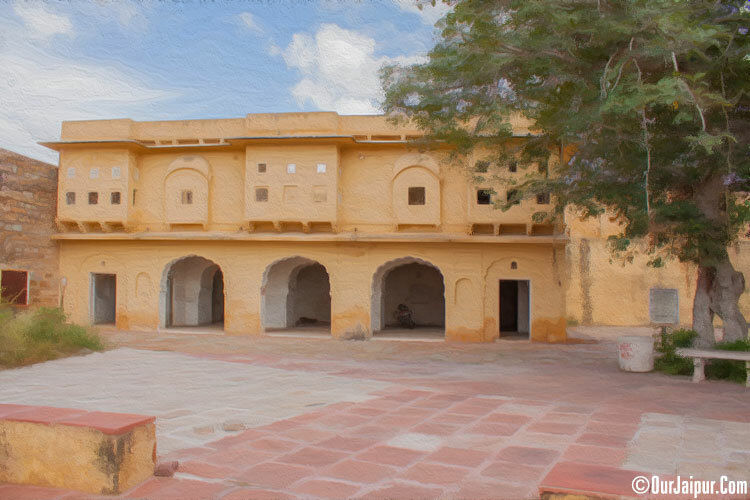 Each of the Maharaja’s nine wives was given a two-storey apartment, which were set around three sides of a rectangular courtyard. 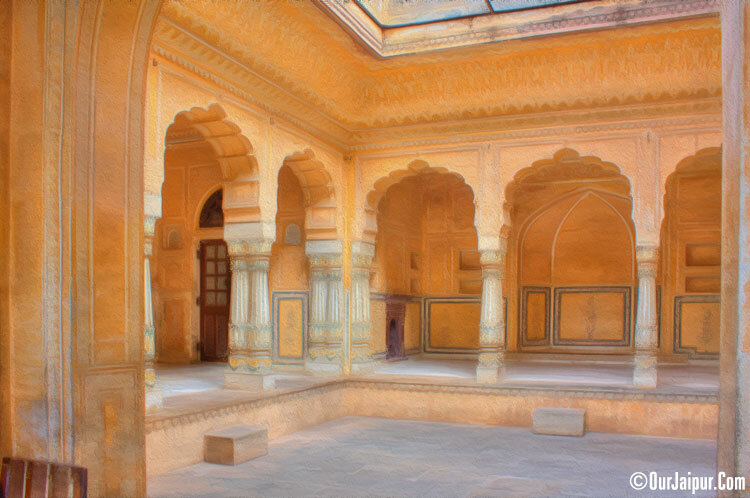 The maharaja’s personal living wing was built on the fourth side. The rooms are linked with each other by means of corridors. The apartments were arranged in such an order that the king could visit any one queen’s room without the knowledge of the others. For his convenience, each queen had her name inscribed above her door. Nahargarh fort of Rajasthan dominates the skyline by day and forms a breathtaking sight when floodlit at night. 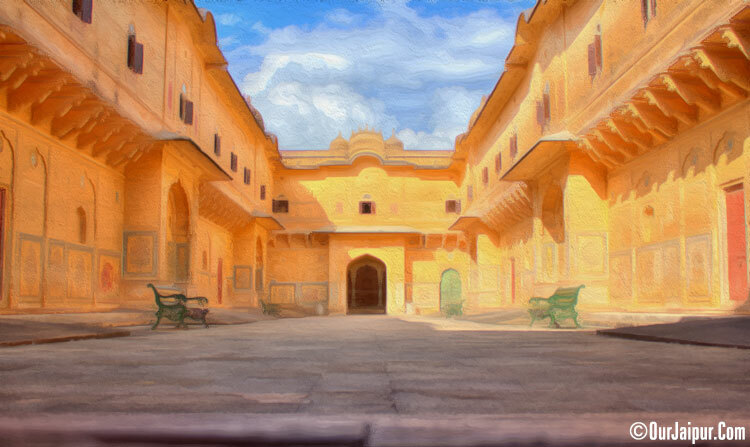 Legend of the Nahargarh Fort of Jaipur, Rajasthan, India. The popular belief is that Nahar here stands for Nahar Singh Bhomia, whose spirit haunted the place and obstructed construction of the fort. To appease the soul a small fortress was built at Purana Ghat where the spirit could reside, and then the fort was renamed NaharGarh. Later a shrine was also added where the warrior could be worshipped. So When you you will reach NaharGarh this is the First Board you will see, at left of this Board you will find The famous Rang De Basanti Bawadi (Step Well) at right you will find an Open air Theater which can be rented for Late Night Parties Nowadays. Bawadi (Step Well) got famous from the movie "Rang De Basanti"
Open Air Theater at Right hand side just before the main Palace. 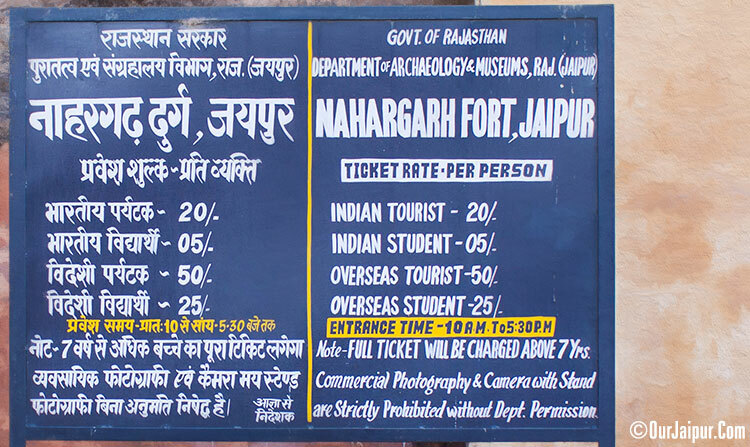 Information Board at Nahargarh Fort, Jaipur. Soldier's Rest House During ancient period soldiers used this place for Rest. A Window I Just liked near the Soldier's Rest House Building. "Diwane-E-Aam" During the Period of Kingdom, King used to do meetings here with General Public here. Bawodi (Step Well) in front of Durg Cafeteria or Madhavendra Palace. 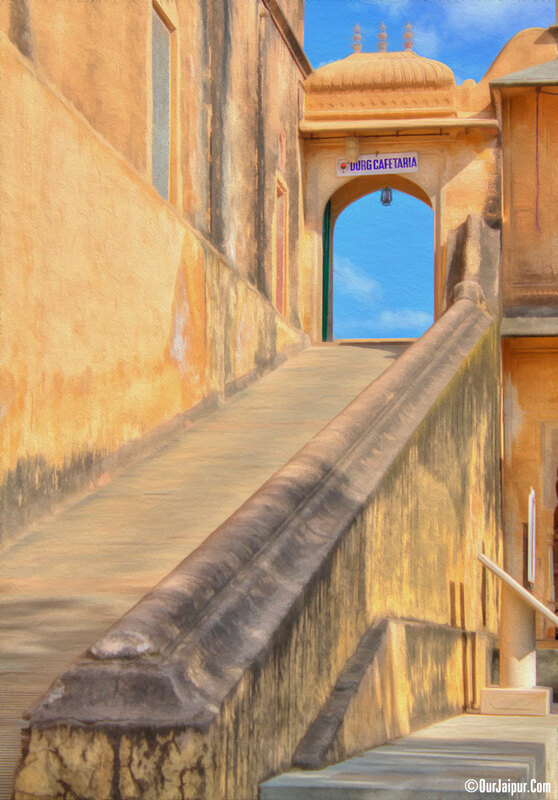 Way to Durg Cafeteria, Nahargarh Fort, Jaipur. 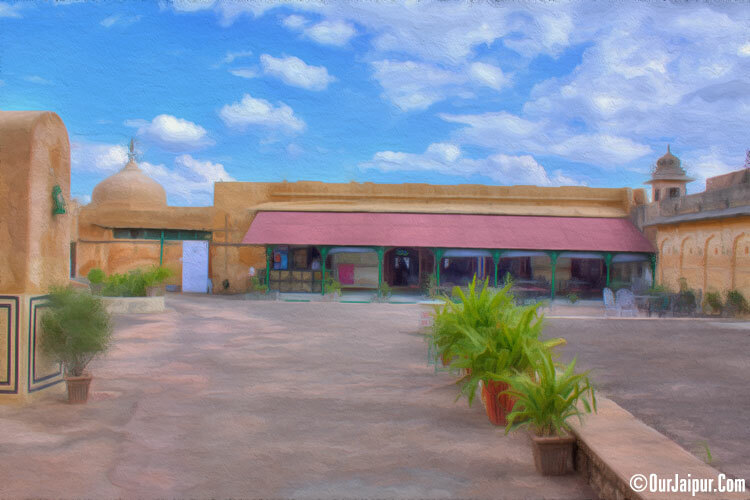 Durg Cafeteria, Nahargarh Fort, Jaipur. 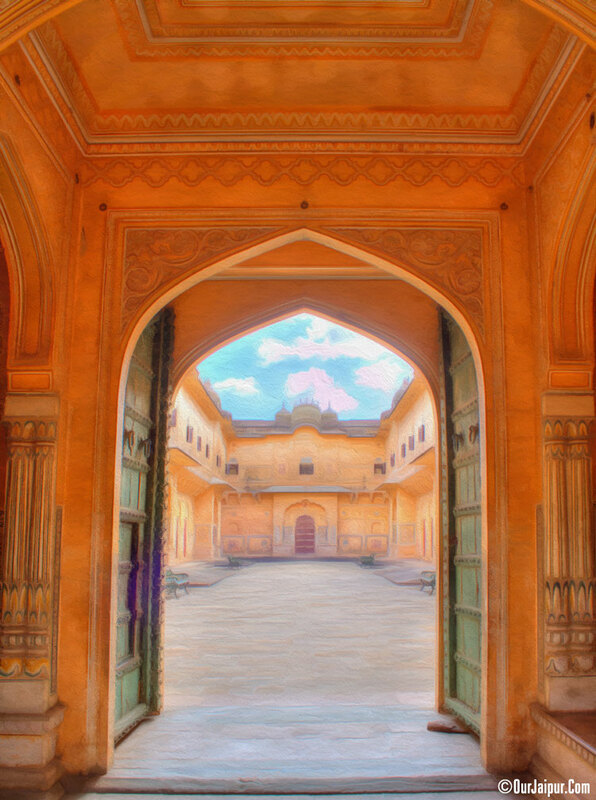 Main Entrance of Madhavendra Palace, Nahargarh Fort, Jaipur. Madhavendra Palace During the reign of Maharaja Sawai Ram Singh II (1835-1880 A.D.) and Maharaja Sawai Madho Singh II (1880-1922 A.D.) marvelous residential palaces were constructed. 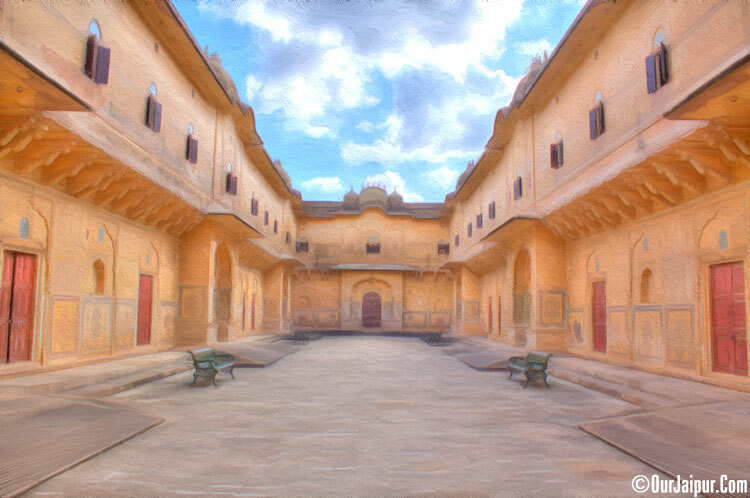 The main palace of king known as “Madhavendra Palace” exists within the Nahargarh Fort. 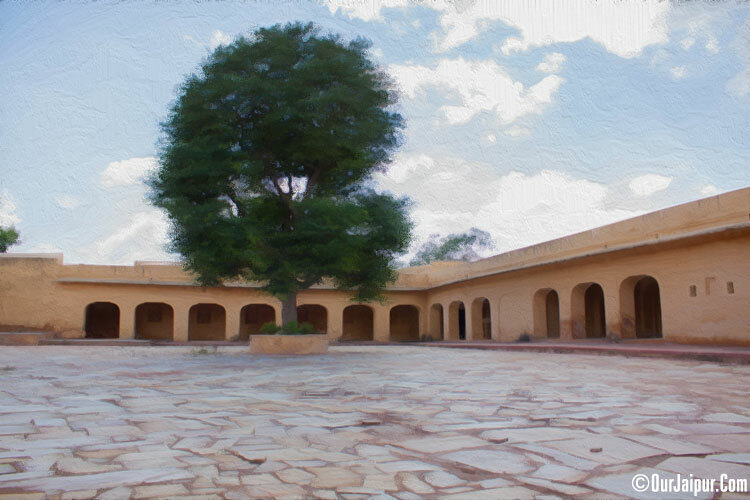 The two-storied palace is divided into nine similar apartments known as Suraj Prakash, Chand Prakash, Khushal Prakash, Anand Prakash, Jawahar Prakash, Laxmi Prakash, Ratna Prakash, Lalit Prakash and Basant Prakash. Each apartment is a double Storied building which contains a lobby, bedroom, toilet, store, kitchen designed according to the needs of the royal family. This palace is an example of beautiful Combination of Indian and European style of architecture. 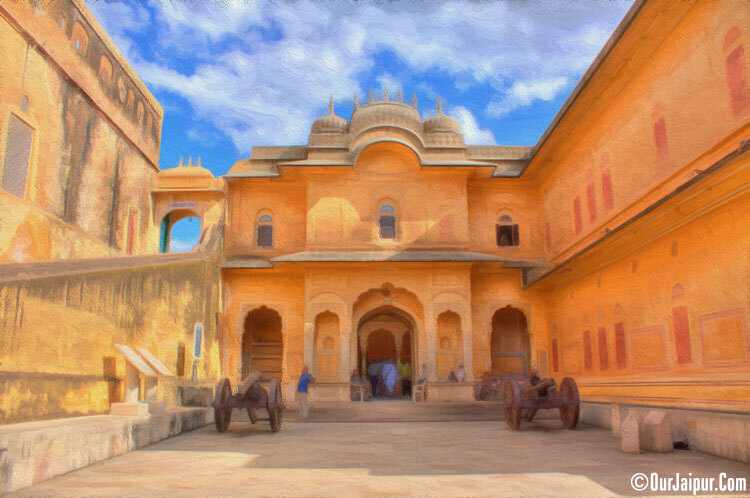 Guards Checking Complex at the entrance of Madhavendra Palace, Nahargarh Fort, Jaipur. Main Entrance Gate of Madhavendra Palace, Nahargarh Fort, Jaipur. Main Compound of Madhavendra Palace which connects to all the Nine Apartments in Palace. 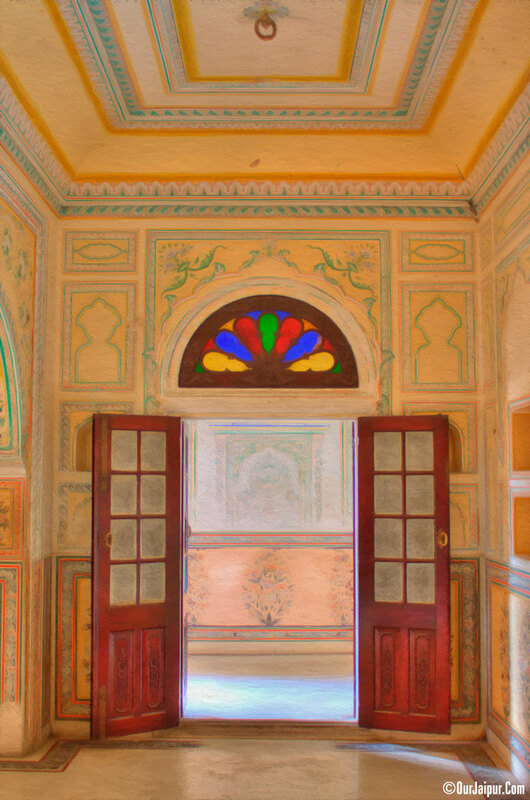 Entrance to One of the Apartment at Madhavendra Palace, Nahargarh Fort, Jaipur. 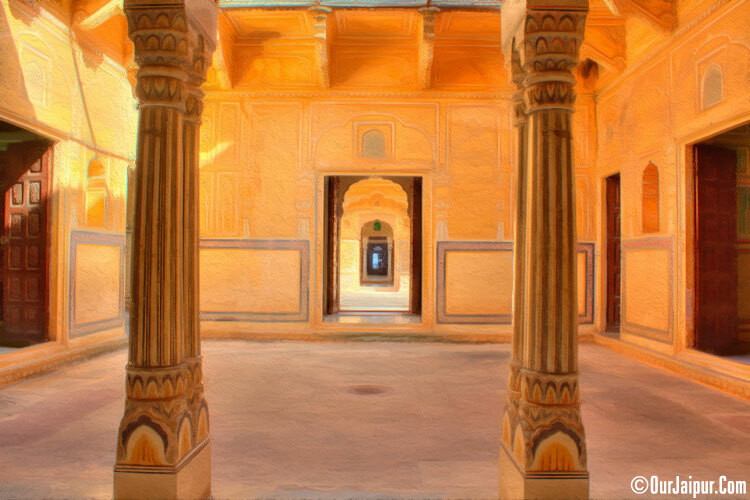 Ground Floor Room at Madhavendra Palace, Nahargarh Fort, Jaipur. 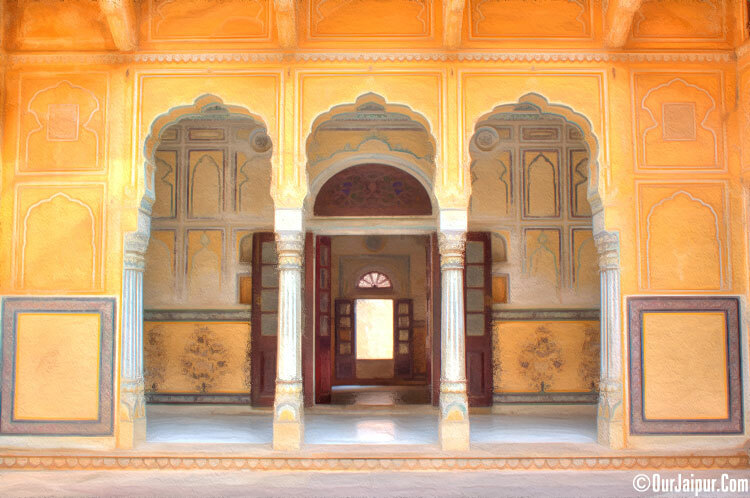 Ground Floor Apartment at Madhavendra Palace, Nahargarh Fort, Jaipur. 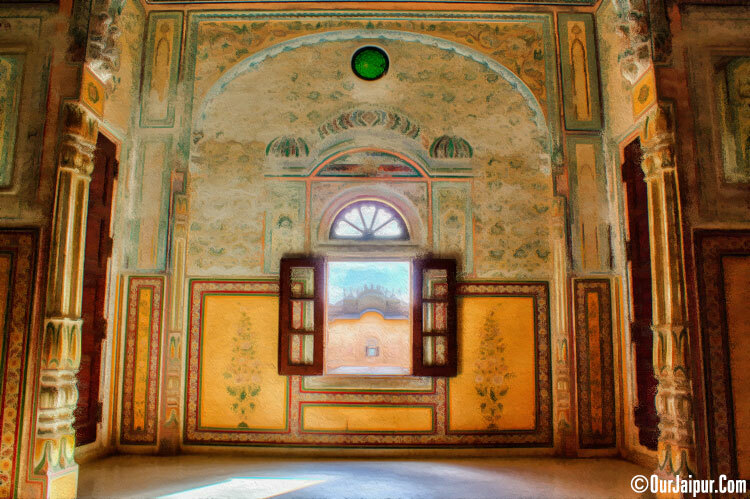 From one Ground Floor Apartment to another Apartment Madhavendra Palace, Nahargarh Fort, Jaipur. 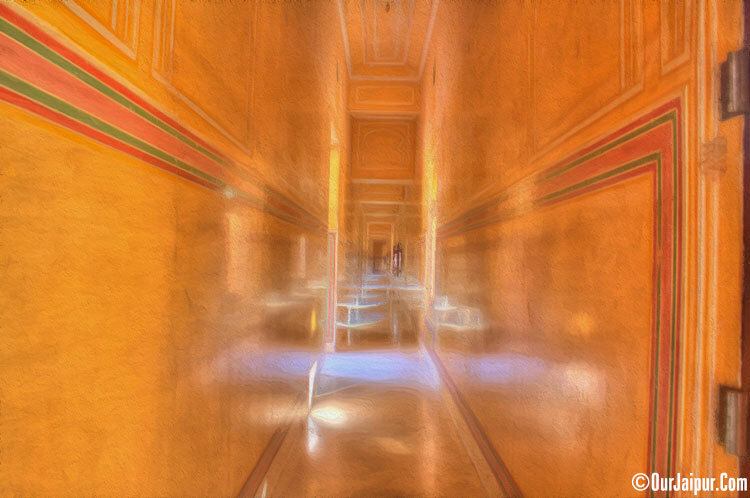 Corridor on First Floor at Madhavendra Palace, Nahargarh Fort, Jaipur. Room at First Floor at Madhavendra Palace, Nahargarh Fort, Jaipur. 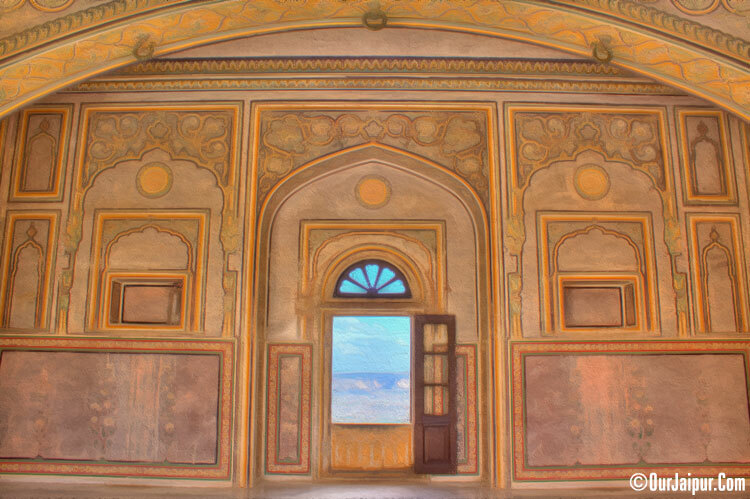 Room at First Floor with beautiful View of Jaipur at Madhavendra Palace, Nahargarh Fort, Jaipur. 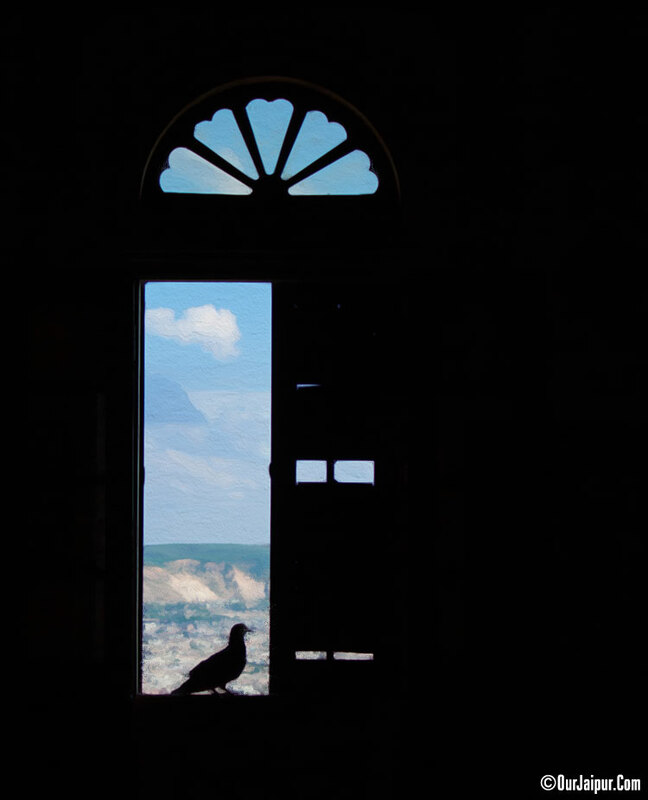 Window with Pigeon at First Floor at Madhavendra Palace, Nahargarh Fort, Jaipur. 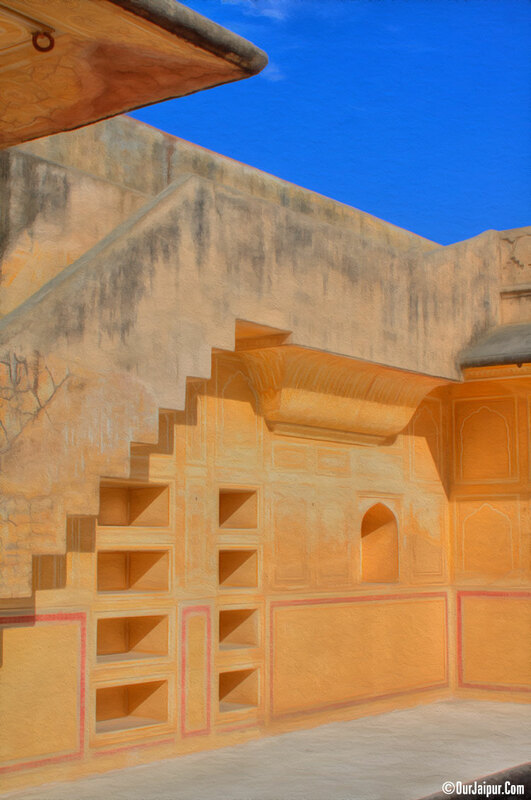 Terrace area at Madhavendra Palace, Nahargarh Fort, Jaipur. 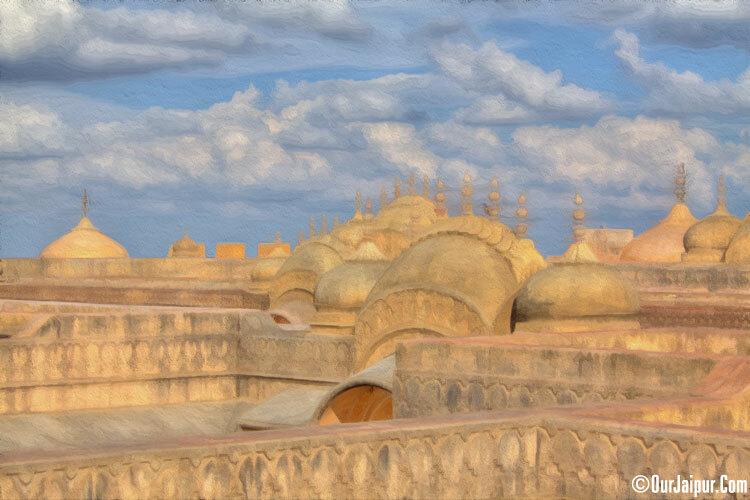 Panorama of Jaipur from Terrace of Madhavendra Palace, Nahargarh Fort, Jaipur. Looking Towards Padao Open Bar/Restaurant from Terrace of Madhavendra Palace, Nahargarh Fort, Jaipur. 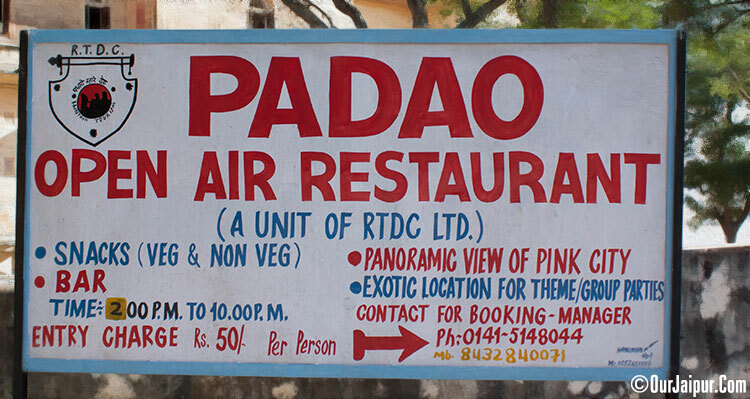 You will see this Board Pointing you towards Padao Open Air Bar/Restaurant when you will come out from Madhavendra Palace. 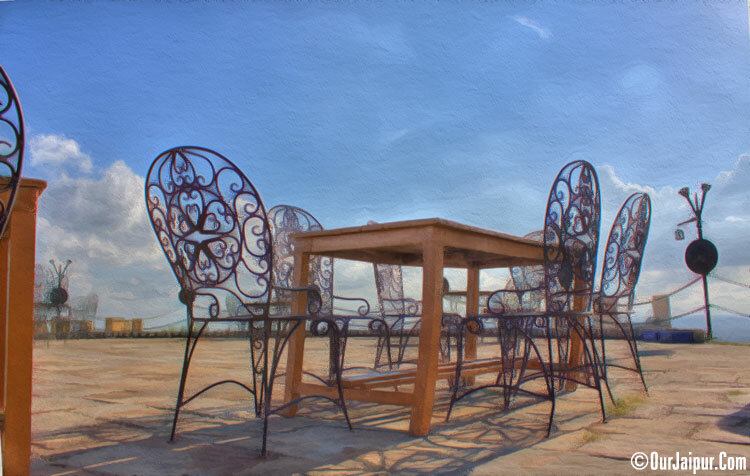 Sitting area at Padao Open Air Bar/Restaurant NaharGarh Fort, Jaipur. I am in short of words after reading your post. The pictures are magnificent! Awesome. I am in love with this particular post of yours! Wow this is extrodinary and gorgeous. 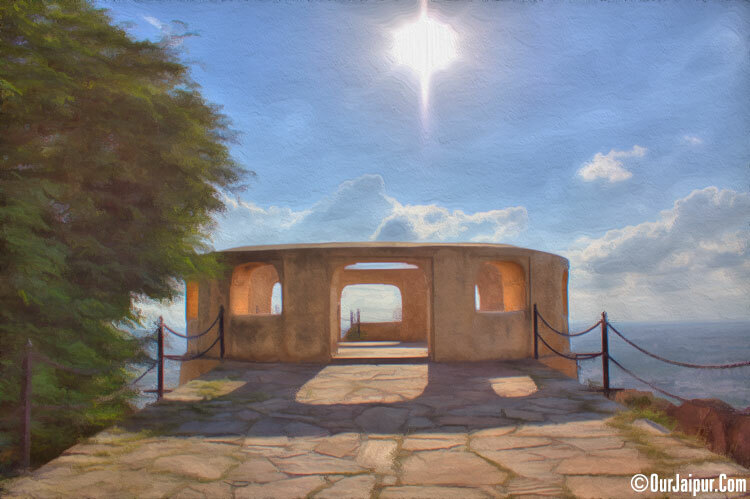 Wonderful images of the fort. Wow! The fort looks like a painting! Have you photoshopped to give such a dreamlike look to the pictures? Nice work! Awesome photos. Is that photoshopped or real painting? Beautiful piece... are the pics photoshopped ? 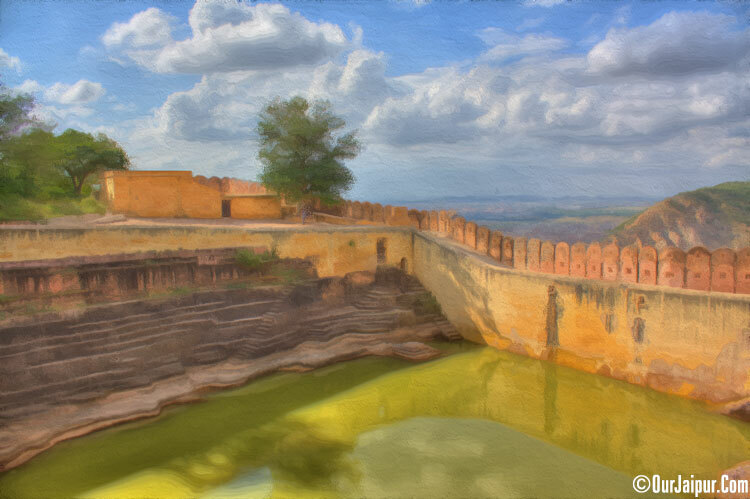 I have been to Nahargarh fort and found it amazing. Your photographs are beautiful. How did you manage that painting effect ? Hi - great post and pictures. I will share something with you - I studied in Jaipur, MREC - batch of 2004. Smiles, That's a decade old now. Even before Rang de basanti was filmed - we lived a few carefree nights when we rode up to the Nahargarh fort at night. Some amazing memories that I will never forget. Beautiful pics dear, thanks for share! Great post and amazing. After reading your posts, I visited Rajasthan recently. It is just amazing and the people are really great. Thanks to you all! Fascinating post, gorgeous architecture and beautiful photos! 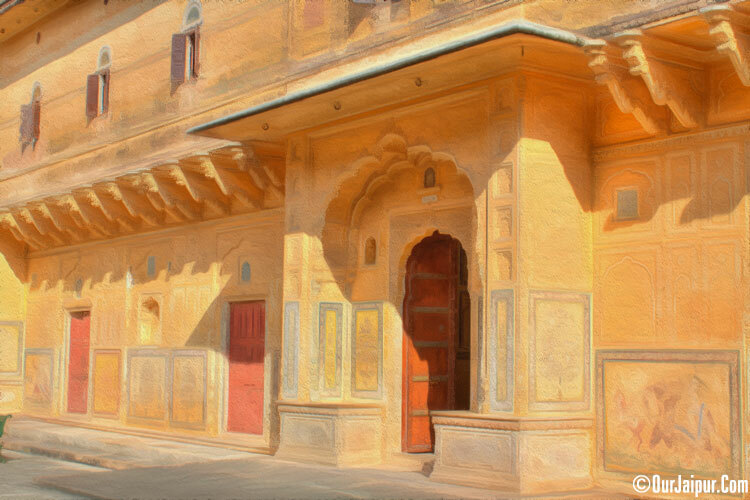 What a treasure trove of information on Jaipur. Lovely work.